My wife and I recently stayed at her parents’ house for a few days while the first floor of our place was being re-ceilinged. While a disruption in one’s life like that is never particularly fun, I did enjoy a change of scenery—there’s something that can be reinvigorating in changing the stuff that surrounds you. I was amongst a collection of belongings accumulated over decades, but weren’t our belongings. This fact was never as apparent as when I closed myself in my father-in-law’s office to record Episode 3 of Erasable (have you heard it yet?). My father-in-law reminds me a lot of Ron Swanson from Parks & Rec. He’s very libertarian, fairly private and extremely independent. He’s a civil mechanical engineer by trade with lots of interesting hobbies—he builds boats, he makes wine in his basement and he collects antique guns. And while not an official collection, he has lot of interesting notebooks—old notebooks—laying around. Look how cool this is! Made by Keuffel & Esser, a US-based drafting instrument and supply company. It was founded in 1867, the first of its kind in the US, and lived on until 1987 when it was bought by the AZON Corp in 1987. So this notebook is at least 27 years old, right? 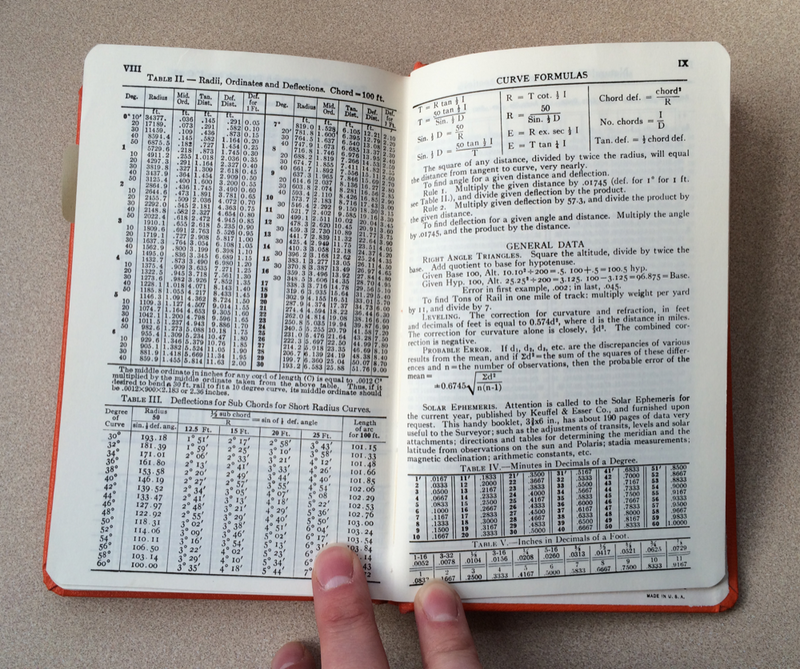 The back pages of the Keuffel & Esser Field Book are filled with data tables, conversions, formulas, and other information an engineer would find useful. Forgive my fingers in the shot — this book has difficulty staying open. I’m not entirely sure of the particular function of this paper (a coworker suggested it’s for lots of tabular data, much like an Excel spreadsheet is now), but the grid on the left is separated into six columns by pink lines, which I believe are three times wider than the horizontal line hight. The right side of the spread is separated into two columns by a pink line, with smaller vertical blue lines that make a grid that’s twice as tall as wide. I blurred out my father-in-law’s name because I assume he wouldn’t want to that out floating around on the internets. This notebook is branded with the “Boorum & Pease” name, which sounds to me like something Click and Clack from “Car Talk” would come up with. 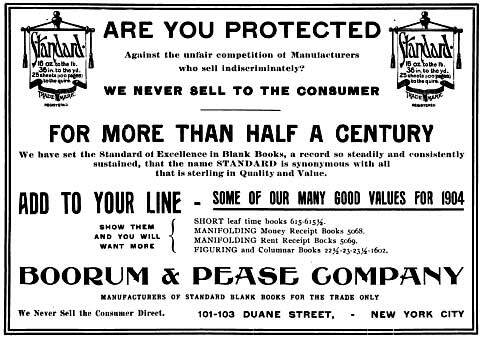 The Boorum & Pease Co (Blank Books and Loose Leaf Devices) has been around since, it looks like, the 1870s (as this 1904 ad boasts, “for more than half a century”). They sold specialized notebooks for laboratories, ledgers for accounting, receipt books, et cetera. 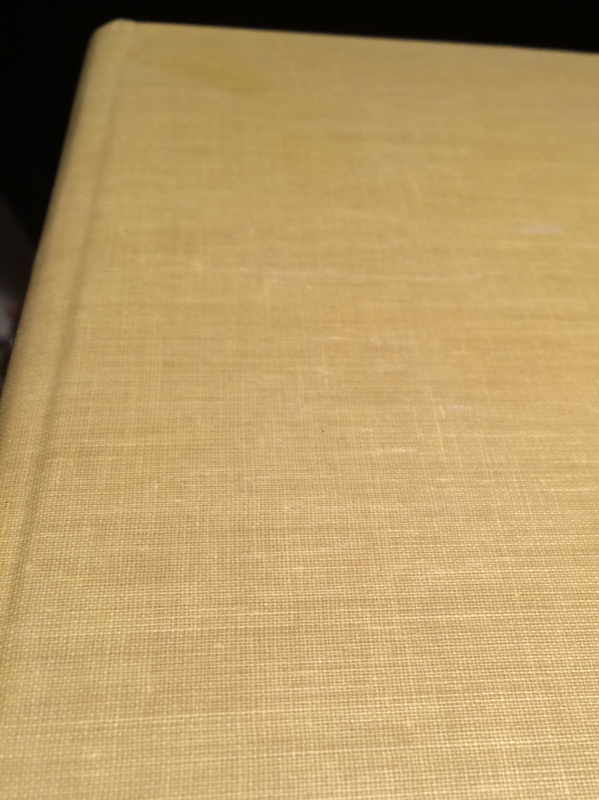 A close-up of the cloth binding on the Boorum & Pease memo book. 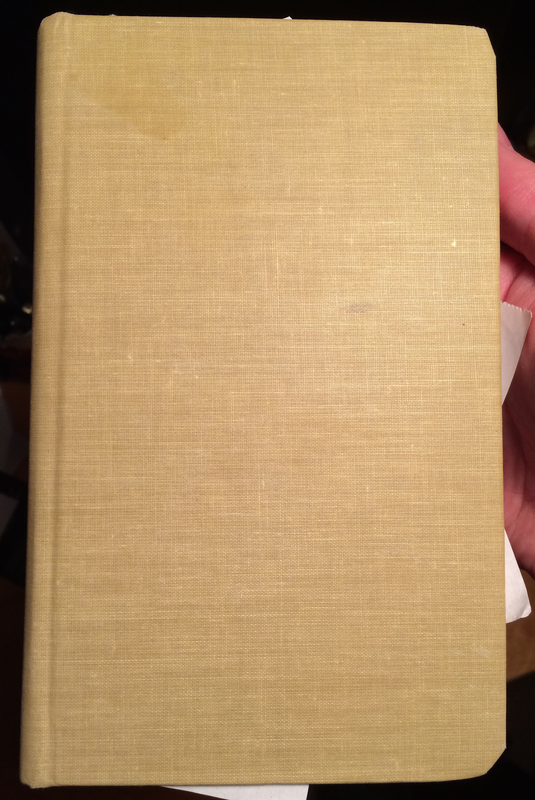 I’m a fan of the binding on this book — it’s cloth-bound, reminescent of old, mid-20th century hardcover books. How handsome would the cover be with a big foilstamped signet or simple illustration? The paper is nothing to write home about, but it’s a nice, plain college-ruled page. It’s thin, but not too thin. Since this isn’t my notebook, I wasn’t able to test it with pencil and fountain pen, but I imagine it might handle a dry to medium fountain pen without too much bleeding. In fact, the still around, though it’s unclear to me who owns that brand name. I don’t think they are their own company. They still make columnar books (kinda gaudy looking, if you ask me), and while this particular model is not still in production (#6565), they still make something that looks reallllly close, #6559. I doubt it’s cloth-bound, though. Here’s a pretty great history of Boorum & Pease by Walter Grutchfield. I’ve seen lots of great memo books like these over the years that just seem like they’re made better than your typical notebook serving similar purposes. Sure, there are small independent ventures that produce great ones now, but these were in mass production, and no doubt costed much less than indie craft notebooks now. Do you have any interesting ones to share? He’s a mechanical engineer; it’s the kind of distinction he’d appreciate. 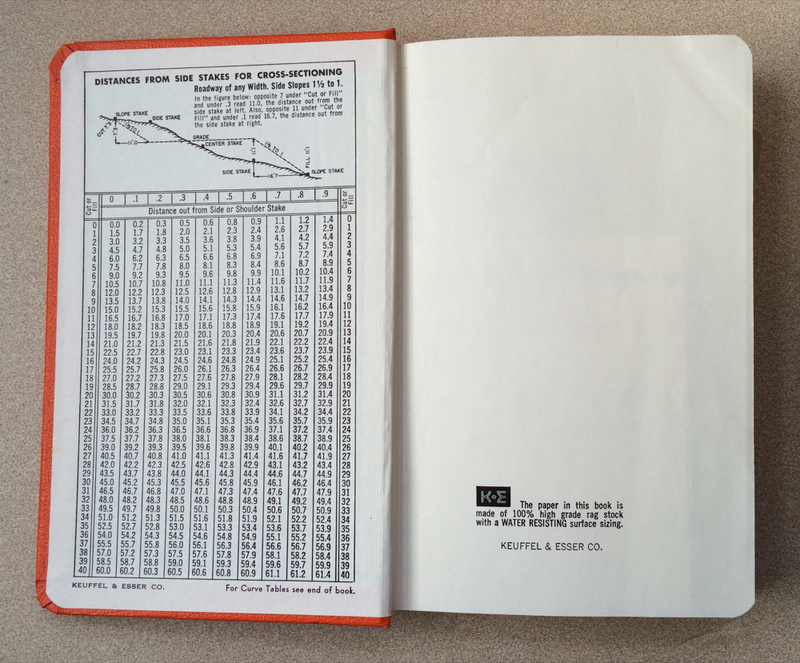 The K&E book is of a type preferred by professional land surveyors. Surveyors have a specific approach to field note taking that lends itself to that column layout. Google “surveyors field notes” and you can see some examples. Some of the charts and tables are probably specific to surveying, and the water resistant paper is critical for preserving notes in bad weather. That kind of book is also used by ecologists, archaeologists, and other poor saps who have to take notes in the rain. 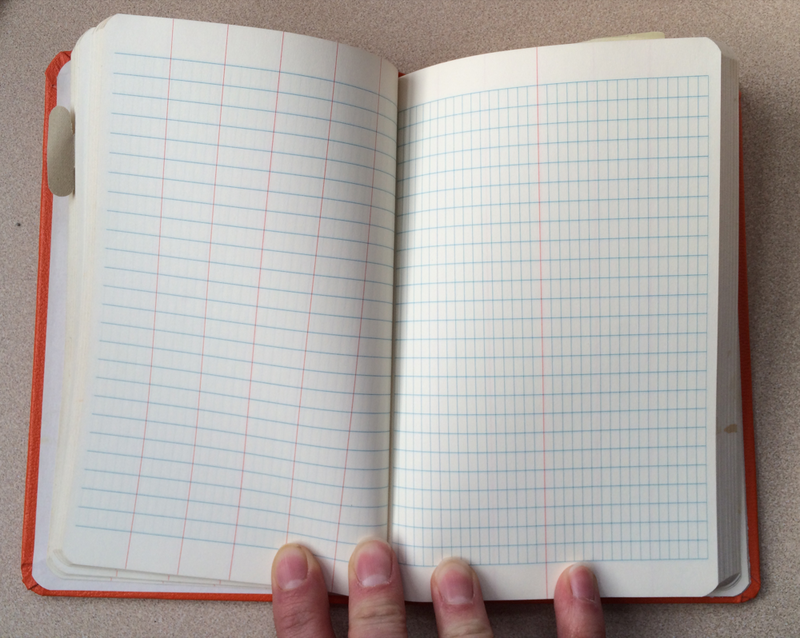 We still have a case of Keuffel & Esser notebooks bouncing around our office. I prefer these over the Rite-in-the-rain books with the same pattern. The unwaxed pages take the ink and lead much better than the “waterproof” pages of the latter. I wish they had done a geologic reference pages set, then they would be prefect. Your father-in-law and I would probably get along very well. Libertarian, wine-making, gun collectors tend to get along well together, though. I have my own plans for a boat which I intend to build as soon as I move to a house with a big enough garage or yard. I love that he has kept all his plans in a notebook. And it’s really fantastic that you appreciate that. Right now ALL of my plans, notes, calendar, and what-not reside in a Leuchtturm 1917 Master (right, the big one). It’s a terrific catch-all, but as I get closer to actually building my boat, I think I will take your father’s-in-law plan of a dedicated notebook on the subject. This used to be a popular idea. 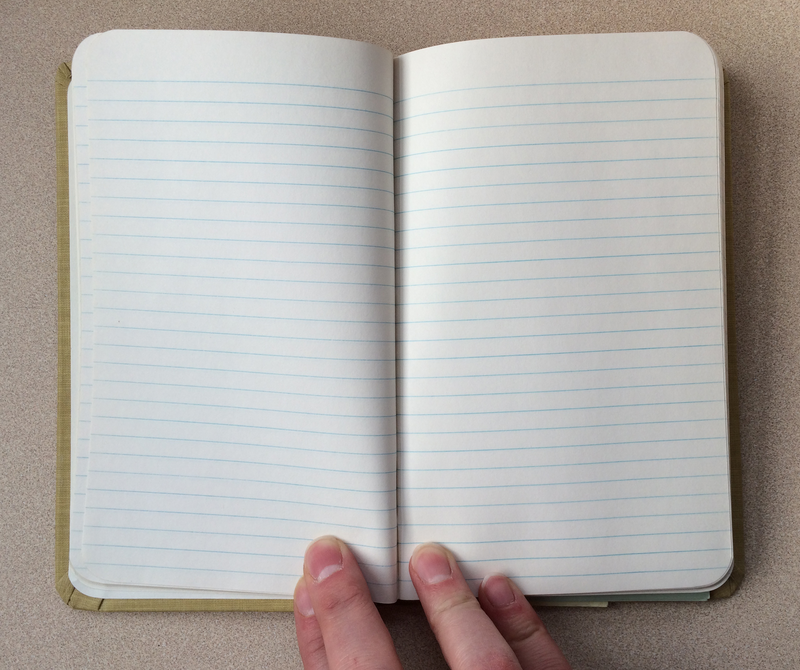 A one-subject notebook…like in school, but well….more on a subject of our choosing. 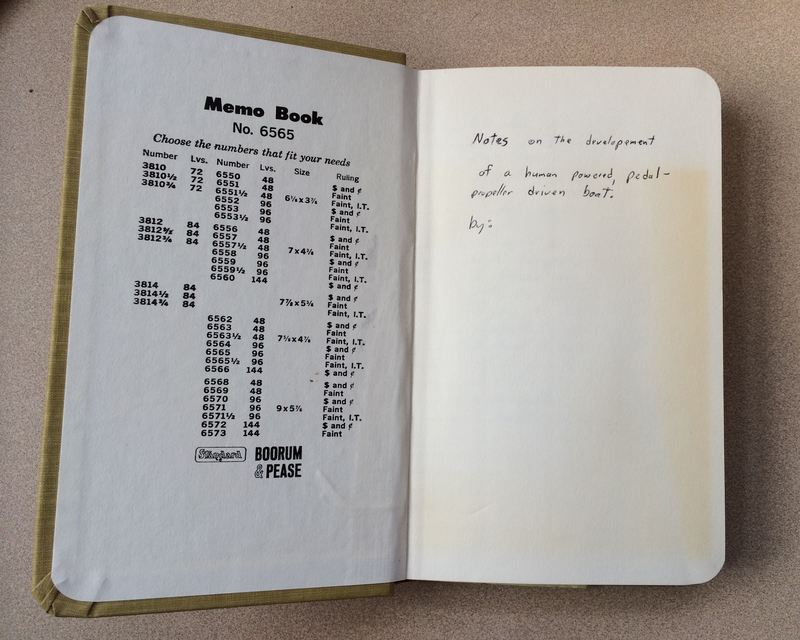 They used to call them monographs, or commonplace books…at least I have been told as much. Any road,, really enjoyed reading about your father-in-law, his notebooks and your appreciation for them. Hey JP, “monograph” certainly sounds correct, being writing devoted to one subject, but I’ve always understood “commonplace book” to be something else. Our forbears used “commonplace books” to record whatever struck their fancy; snatches of poetry, news items, tidbits of gossip, recipes, quotations, passages from their reading, etc., all stuff they wanted to remember but not important enough to memorialize in any kind of systematic way. When my grandma was young, she wrote down her recipes in a small notebook. I love the feel of the paper! It’s so different from today. It makes me happy every time I bring it out and see her notes scrawled across the pages.